The main claim of this book is that contemporary African art can be best understood by examining the tension between the period of great political changes of the era of decolonization that enabled new and exciting imaginations of the future to be formulated, and the slow, skeptical, and social decline marked by the era of neo-liberalism and Structural Adjustment programs of the 1980s. These issues are addressed in chapters covering the themes of "Politics, Culture, Critique," "Memory and Archive," "Abstraction, Figuration and Subjectivity," and "The Body, Gender and Sexuality." In addition, the book employs sidebars to provide brief and incisive accounts of and commentaries on important contemporary political, economic and cultural events, and on exhibitions, biennales, workshops, artist groups and more. 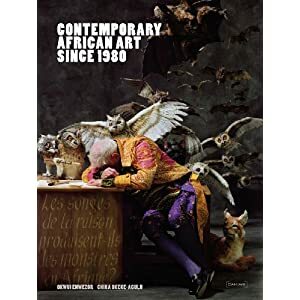 Rather than a comprehensive survey, this richly illustrated book presents examples of ambitious and important work by more than 160 African artists since the last 30 years. This list includes Georges Adeagbo Tayo Adenaike, Ghada Amer, El Anatsui, Kader Attia, Luis Basto, Candice Breitz, Moustapha Dime, Marlene Dumas, Victor Ekpuk, Samuel Fosso, Jak Katarikawe, William Kentridge, Rachid Koraichi, Mona Mazouk, Julie Mehretu, Nandipha Mntambo, Hassan Musa, Donald Odita, Iba Ndiaye, Richard Onyango, Ibrahim El Salahi, Issa Samb, Cheri Samba, Ousmane Sembene, Yinka Shonibare, Barthelemy Toguo, Obiora Udechukwu, and Sue Williamson.